Watermelon – Sweet and Savory! juice and spitting of seeds to get a fleeting mouthful of sugary, watery crunch. goat cheese and herbs in processor or by hand. Add a small amount of olive oil to moisten and smooth the mixture. Set aside. melon, olives, tomatoes, and greens together. Toss with salt and pepper and chopped tarragon to taste. Drizzle with olive oil, and toss gently. Add vinegar to taste, and toss again. crisp, sweet melon are a perfect combination. watermelon find was this recipe from Bloomington Cooking School owner Jan Bulla-Baker, for Watermelon Gazpacho. with salt and pepper to taste. Refrigerate. Serves 15-25.
with a mixture of spicy chili powder and kosher salt. My mouth is still happy. Oh Oh OH! You are never going to believe this–I just shoved into the fridge the FRESH CHEVRE I made from the goats I’ve been milking ALL WEEK LONG for a friend of mine! Oooo… watermelon & chevre, here I come… btw, at Cafe Provencal in St. Louis we had a wonderful version of this salad that featured, I believe, a sweetened olive oil as dressing–total yum. Also, I finally did that sermon on food issues at my church last week to a great reception. It’s posted on my blog if’n ya wanna see it, although it’s quite inappropriate for a class, I think. I got quite a bit of interest in Slow Foods, though! May be a convivium in the offing here after all! Both look sooo light and refreshing!! 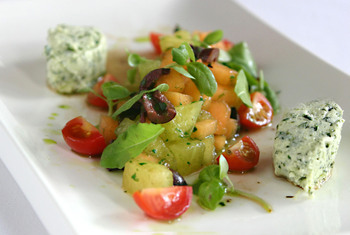 Lovely photo of the salad, and of course I would love this because there’s goat cheese and tarragon! What more do you need? I’ve got a watermelon in the frig just waiting for this gazpacho. I’m psyched. I am so going to be making that salad. Thanks Christine! 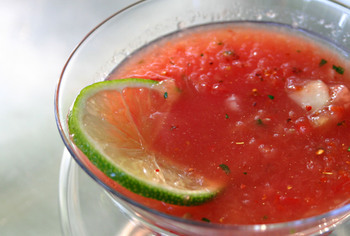 The watermelon gazpacho looks divine, especially on this very hot evening in Rhode Island. Must be sure to try that before summer ends…. What cool recipes, as pretty as they are refreshing! Now I’m going to have to go out for watermelon – I have everything else! Christine, I love the idea of having watermelon on a salad! Lovely recipes, Christine, though I’m especially drawn to the salad; it must be as delicious as it is beautiful. I just posted a watermelon salad a couple of weeks ago with olives in it, and now I’ll be trying yours with goat cheese.